Wendy Barker's sixth collection of poetry, One Blackbird at a Time: The Teaching Poems, received the John Ciardi Prize and is forthcoming from BkMk Press in 2015. Barker has also published three chapbooks, a selection of poems with accompanying essays, Poems’ Progress (Absey & Co., 2002), and a selection of co-translations, Rabindranath Tagore: Final Poems (Braziller, 2001). 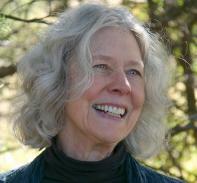 Her poems have appeared in numerous journals and anthologies, including The Best American Poetry 2013. Recipient of NEA and Rockefeller fellowships, she is Poet-in-Residence and the Pearl LeWinn Endowed Professor of Creative Writing at the University of Texas at San Antonio. It's the time of year—September nights cooling—we dropped our father's ashes into the lake. They weren't what I'd thought of as ash. Too many bits of bone. Twenty-five years ago he died, same age I am now, about to turn seventy. "How old would you be if you didn't know how old you are?" said Satchel Paige, but most of me feels every bit of seventy, though my doc says I've the bones of a twenty-year-old. James Weldon Johnson's song: "Them bones them bones them dry bones." My father played that Mills Brothers' 78 over and over, along with "Lazy River." What happens to bones in water? Last summer during the monsoon, I plodded through Cambodia's Killing Fields, stumbling over bones. A femur beside two pebbles on the path, and, in a pool of muddy water, metacarpals—metatarsals?—and, further along, clearly, a rib. "Them bones them bones gonna walk around." Bones surfacing still, after even a light rain. Centuries, it can take, for bones to decompose. Hired crews collecting them. From whose bones? Horses, dogs? Pets put down? Muscle shreds removed and sold for pet food. From pets to pets. Then they're heated, the raw bones, 1,000 degrees centigrade, sterilized, and ground with water. Extremely hard, intensely white, fine bone china allows light to pass through. 50% bone ash, the rest, clay and stone. My grandma's "gold band" pattern: Lenox Westchester, introduced in 1915, about the time she married. A solid gold rim circling that shimmering white surface. White as white can be. The ash left when bones burn can also be used as fertilizer, high in calcium phosphate. Food for a field of corn, or spinach, broccoli, or tomatoes, color to pile on those plates along with porterhouse steaks, lamb chops, pink flesh still attached to bone. Without them, we'd be slugs, sliming through grass. Helmet over the brain, chest plate for lungs. Storage for calcium, phosphorus. It's bone marrow that makes our lymphocytes, blood cells. Long, short, and cube-shaped: the wrist and ankle bones. Flat bones: the sternum. A fetus begins forming bones about the tenth week. At birth, an infant's body contains over 270 bones. Then they fuse, their number reduced by a quarter, our flab, protruding veins, our discolored flesh masking the framework within. All this pulp I carry, this enveloping epidermis, these muscles that cramp and twinge. Some days I'd like to get down to the bone. If I could be rinsed clean of all these messy casings, face daylight, the sun's glare, with a clean, white, solid edge. Like a book, Mom said about life: you turn the page and go on. The same way she moved in and out of houses. Garage sale after sale. Each year like a chapter torn from a book's spine and hurled. But some of us go back, looking for patterns. The way a novel builds, chapter upon chapter, like a pelvis resting on the femur, femur on the patella, on the tibia and fibula. That film I can't forget: Aftermath, story of a Catholic Polish farmer who discovers Jewish tombstones buried under the town's road. He's obsessed with digging them up, five-foot, rounded headstones, one by one. Doesn't know why. He plants them in rows, like corn, in his field. Learns Hebrew, reads the inscriptions, names and names. During the months before she died, when I begged her to talk about her childhood, my mother changed the subject, demanded more milk in her tea. Let sleeping dogs lie, the villagers, even the young priest, warned that farmer. Years ago, Mom told me about a nightmare. She was racing, breathless, through a walled, labyrinthian garden to save herself from a gigantic man. How many houses had it taken to escape? New Jersey, Arizona, house after house, different towns, and finally, in less than a decade, three houses in New Hampshire. Each one repainted. In the end the farmer learns it was his father who'd led the villagers in a round-up of the local Jews, locking them in the family's cottage, which he set on fire. His own father. Once I dreamed of myself as a toddler, walking down an unlit hospital hall with closed doors on both sides. I was holding my mother's hand. But no, she was gripping mine. The night before the family's ceremonial scattering of Mom's ashes on the New Hampshire lake she'd loved, I slept with the cannister beside me. Sunrise, I carried it down to the dock, opened the lid. Her bones crushed, but in one place. I reached in, gathered a small handful, and over my arms and legs spread powdery flakes. I slipped then, into the water that carried them, glittering, in the light.